The world’s most famous console preamp and EQ continues to evolve to meet the needs of the modern studio. It’s amazing to think that a mixing console input module designed back in 1970 is still being repurposed 47 years on, but that’s what AMS Neve have just done with the 1073 SPX. The classic Neve 1073 input module was designed for a bespoke mixing console called the A88, built for Wessex Studios (which, sadly, is now long gone!) in Islington, London. It’s a discrete semi-modular transistor design with transformers on both the input and output, and a three-band EQ plus separate high-pass filter. Until recently, AMS Neve offered six different incarnations of the 1073. One is a faithful recreation of the original input module for use in vintage consoles or bespoke racks, and another (1073N) is an updated version which can be used in consoles or racks, but is really intended for use as a (horizontal) standalone module. Then there are two dual preamp-only models (lacking EQ) called the 1073 DPA and 1073 DPD (the latter with an integral A-D converter), and a 500-series version split across two modules, with the preamp stage in one and the EQ section in a second (1073 LB and 1073 LBEQ, respectively). Up until now, the only full-facility rackmounting option was the dual-channel 1073 DPX (reviewed in SOS March 2015), in which the original circuitry is loyally recreated but extended to incorporate additional features appropriate to today’s working practices and technologies. 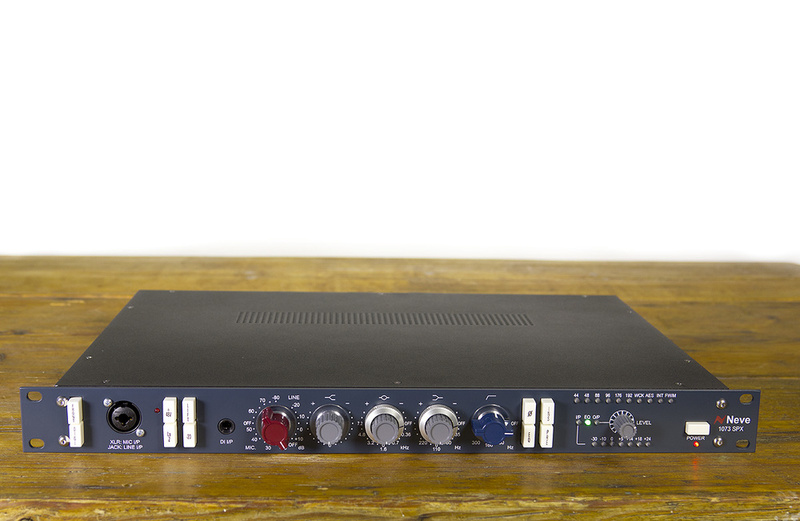 The seventh, and latest member of AMS Neve’s 1073 family is the 1073 SPX, which is a single-channel version of the 1073 DPX — it’s aimed at those with slightly tighter budgets, or who only require a single channel. As might be expected, this new version occupies 1U of rack space instead of two, extends around 310mm (12 inches) behind the rack ears, and weighs around 5kg (11lbs). As with the DPX, the SPX version expands on the original 1073 module by incorporating an instrument (DI) input, phantom power, balanced insert send and return, level metering, and both front- and rear-panel connectors. 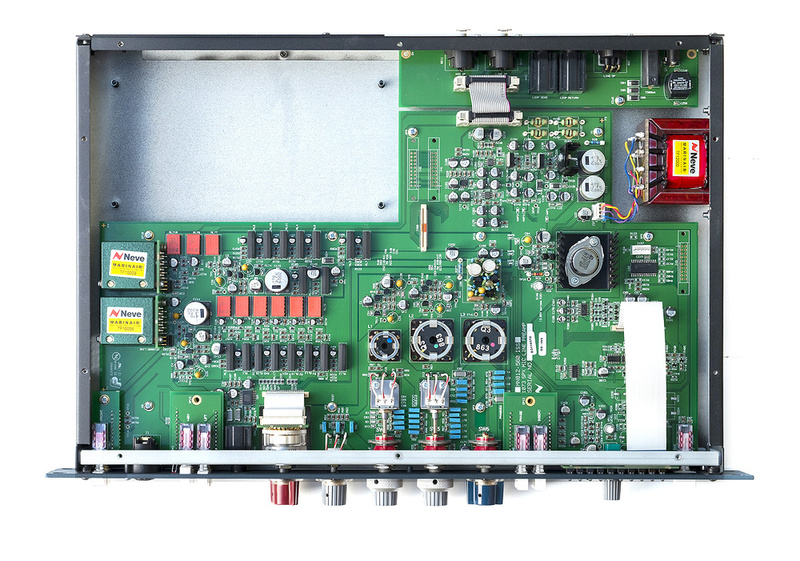 Also like its big brother, an optional digital board can be installed to provide internal A-D and D-A conversion with AES3 I/O and FireWire connectivity, plus word-clock I/O. Given the very close similarity of the 1073 DPX and SPX models, I won’t cover every detail here, but please read my DPX review online (http://sosm.ag/neve-1073-dpx) for a more in-depth account. 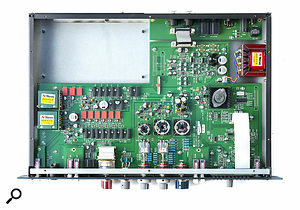 In brief, then, the SPX is powered from the same external 48V DC universal ‘line-lump’ power module as the DPX, which connects to the rack chassis via a small coaxial plug. While this approach has the advantage of keeping the mains away from the internal audio transformers it doesn’t feel as professional or reliable as might be expected of a high-end Neve preamp. The absence of a cable retainer troubles me but, more importantly, the front-panel power button only affects the internal DC rails and doesn’t provide mains isolation of the PSU. Most of the front-panel controls are identical to the DPX, starting on the left with a pair of buttons to select the front-panel ‘combi’ XLR as the mic/line input source (rather than the rear-panel sockets), and to route (if fitted) the digital card’s D-A output into the line input. Next up is a quartet of buttons with the left-hand column selecting the mic input’s phantom power and input impedance (300Ω or 1.2kΩ), while the second column configures the separate DI input with a ground lift and a 20dB pad (which also reduces the input impedance from 1MΩ to 10kΩ for active instruments). Plugging into the DI socket automatically selects that input in place of the mic/line inputs. Another quartet of buttons selects a polarity reversal, engages the EQ, switches in the insert processing, and moves the insert point pre-equaliser (it is post-EQ by default). This array of buttons is followed by an output level control (with 5dB of gain above the marked reference position), and a bar-graph meter which can be switched (by pressing the volume knob) to monitor the signal levels at the preamp output, the EQ output, or the final output. As well as duplicating the mic and line inputs on the rear, there are insert send and return jack sockets.All of this is absolutely identical to one channel of the DPX, but that model’s headphone amplifier has been removed from the SPX and a row of LEDs added to indicate the sample rate, clocking, and format of the (optional) digital card. This is an improvement in my view; in the DPX the sample rate and clock source had to be selected with a couple of buttons on the digital module itself, which meant gaining access to the unit’s rear panel — something that is rarely easy to do when the preamp is rackmounted. Although it’s not intuitive and there are no panel markings to provide a clue, the clocking and sample-rate functions are accessed in the SPX by pressing and holding the output level knob for a few seconds, after which the sample-rate display starts cycling around the options; releasing the knob selects the option currently displayed. Like the DPX model, the rear panel features the coaxial 48V DC power input socket and (500mA) fuse-holder (but no cable clamp), a male XLR for the transformer-balanced line output, two female XLRs for the (transformer-balanced) line and mic inputs, and a pair of quarter-inch TRS sockets for the balanced insert send and return connections. A blanking plate covers the slot for the optional digital card. A peep inside the case reveals the usual high standard of internal construction by Neve, and traditional components such as Marinair transformers alongside more modern surface-mount devices.The internal construction is almost entirely surface mount, and it is built to very high standards. I was expecting the PCB to be identical to one layer of that employed in the DPX, but in fact the circuit board in the SPX is laid out slightly differently, presumably in part to accommodate a differently shaped digital module. However, the same six three-transistor gain stages are present, as are the three EQ inductors, Marinair mic, line and output transformers, and the chunky 2N3055 output drive transistor. The instrument input is processed by a Burr-Brown INA103 high-quality instrumentation amplifier chip. Neve’s 1073 preamp has acquired a well-deserved status as one of the world’s most popular preamps, and the company’s latest incarnation can only further that reputation. The 1073 SPX enhances the original input module design very sympathetically to provide facilities better suited to current working practices. The unit looks very classy, with original-style buttons and knobs, and the ability to control the optional digital module from the front panel is a worthwhile step forward compared to the previous dual-channel 1073 DPX. Technically, the SPX delivers all the performance and tonality expected of the 1073 module, and being a single-channel version it represents a useful price-saving over its two-channel sibling as well. There are countless 1073 preamp clones on the market in a variety of form factors, prices, and with different degrees of constructional and circuit accuracy. Classic 1073 circuitry and styling, with modern workflow enhancements and construction. Mic/line inputs on both front and rear panels. Balanced insert send and return. Optional digital I/O card with digital line input. Output level control and metering. Front-panel control of digital card sample-rate modes. External line-lump PSU with no cable-retainer. It’s still an expensive mic preamp (inevitably). Yet another skillfully re-engineered version of the venerated 1073 input module in a 1U rack-mounting chassis, blessed with a dedicated instrument input, balanced insert send/return, metering, extra front-panel connectivity, and a digital I/O option.